If you're still struggling to find the perfect Mother's Day gift for candle lovers, Boujies London have it covered. Launched in 2010, Boujies candles are made from 100% natural waxes that are housed in sophisticated silver tins that wouldn't look out of place sitting on any dressing table. I was sent the Chelsea Flowers* candle to test out, and while I don't really favour floral scents, I was quite taken aback over how much I enjoy it. It is flowery, but it contains a hint of sugary sweetness that boosts it up to a scent I really like. It burns incredibly cleanly, and the scent fills the room with no problems. I did find that I had to pry the lid off with a knife though, but at least it's secure in the tin! The Chelsea Flowers* candle would be a great gift idea for mums that don't find the likes of Yankee Candle grown up enough in scent, and they also offer other interesting fragrances such as Earl Grey and Black Ginger, which I can imagine would be pleasing enough to the males in the house, too. Boujies London candles retail for £14.00 each here. 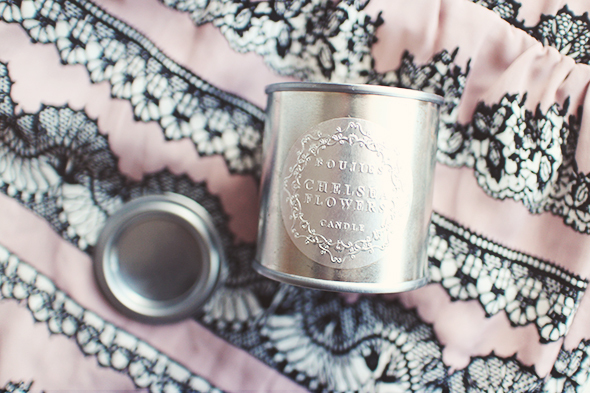 Love the metal packaging on this candle, I'm sure my mom would love it!